Last week, I told you about the changes that are coming to Google Finance. The financial site is getting a makeover of sorts and part of that is the retirement of portfolio management. However, we could be getting a glimpse of how the new look is going to play out thanks to Google Search. For a long time, you have been able to search for any stock within Google search and get pricing and other news related to that stock. Previously, that was one long page within search once you found the stock of interest. Quietly, over the weekend, it appears that Google changed this to be a tabular style look. tab. Again, all of this was there before. The content itself hasn’t changed, just the way that Search presents it on your phone. This could be the first real indicator of what the new Google Finance is going to look like. These tabular designs are a part of the overall Material Design concept and Google is pushing hard to make Material Design a part of everything. There is no update to get this new look by-the-way. 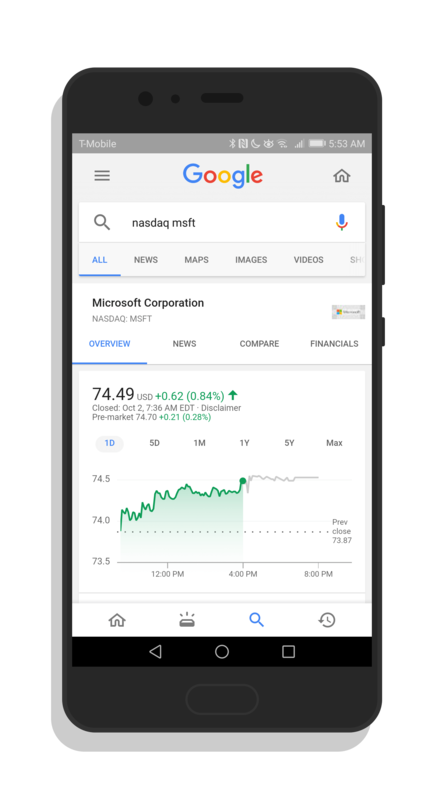 So long as you have the latest Google search app on your phone or tablet, you will see this new Google Finance look once it rolls out from the cloud-side to your account.